The LST Attic Ladder is a Scissors Attic Ladder equipped with a 3.6cm thick white insulated hatch as standard. The box structure is made of wood and features quick-installation brackets as standard. The hatch unloading mechanism supports the unit in any opening position in addition to when fully opened. This guarantees safe ladder folding and unfolding. The ladder itself is powder-coated in grey RAL 7022. 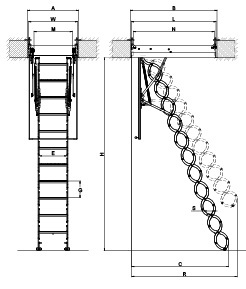 Overall ﬂoor-ceiling ladder height can be increased to a maximum 3600mm by adding LSS segments.